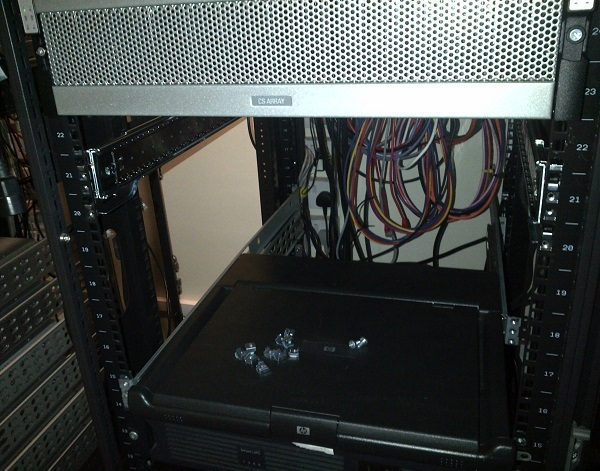 I have just completed the installation of a shiny new ES1 Expansion Shelf for our Nimble Storage CS220 Array, and decided that the next thing to do is to shout about how easy and straight forward it was. If you want to know why we purchased the shelf and what our reasoning was behind it, then please read my article about Infosight. Although this is titled the “Hard Bit”, it’s more along the Hardware installation than anything more taxing than fitting a couple of rack kits and lifting a 30Kg box..
Before you start you must check the version of Firmware that you are using on your existing Nimble Head Unit, in order to add an extra shelf it must be v1.4 or higher. This can be checked by logging into your Nimble Array and choosing Administration. First Job, remove the old girl, our Hitachi AMS200. 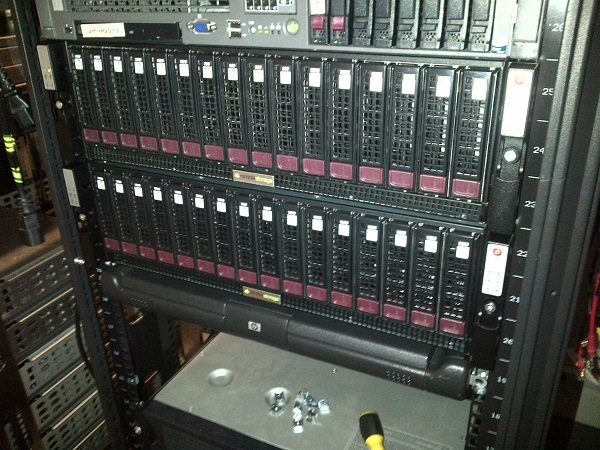 Nearly 8U of iSCSI storage, split across Fibre Channel and SATA disks – delivering a whopping 10Tb. Once the cables were removed and the units unscrewed, we had a very large empty space. Installing the side rails was fun; two things to note, the side rails come in two sections (as per normal) the part that fastens to the Nimble is a tight fit and MUST slide far enough for the T shaped clip (as shown in the image) to sit flush. Otherwise, although the rail feels solid the Expansion Shelf will not slide in correctly and you will have one side secure and the other not! Also, the telescopic arms actually clip into the lower set of the 3U available, for us that was U21 & U20 (right image). We did a little trial and error, but got them in the right place second time lucky. The top of the metal arm should just peep in to the top of the 3 U (you can just see the silver shining in U22). Once it’s all secure, just slide the baby back in to the rack ans tighten the thumb screws. Round the back of the rack you only need to worry about two things, power and the SAS connections. 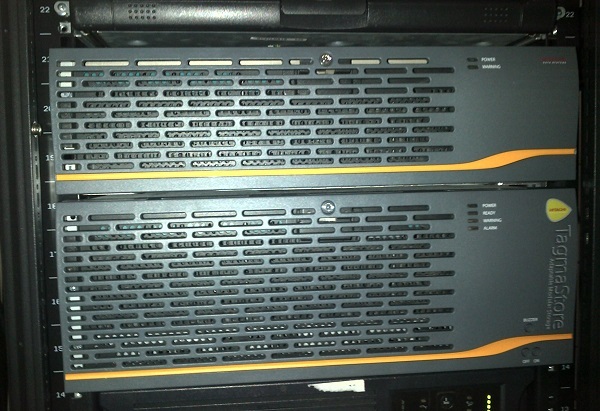 To avoid any power outages we ensured that the two power supplies were connected to two separate UPS’s on different rings – this was the same configuration we used for the original CS220 Head Unit. 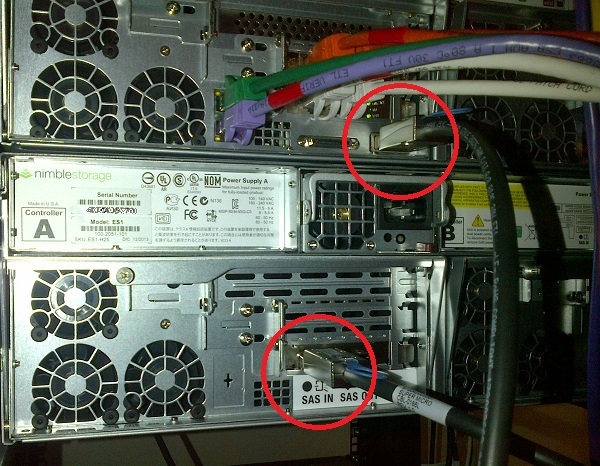 The SAS connections are very clearly labeled and circled in Red on the image below. Back to the front of the unit, simply clip on the silver cover and press the power button. 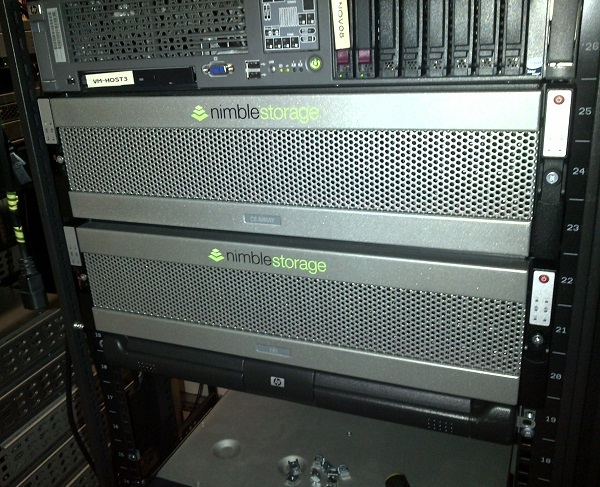 You now have 20TB of 20,000 IOPS in 6U of rack space. The additional Shelf is also represented in the GUI, please follow this link to see the changes.